The Stu SUP 9'6" - Goosebay Sawmill and Lumber, Inc. The new rib design lets you build the rails two different ways (built up solid rails or wood strip hollow rails) for even lighter finished weight. 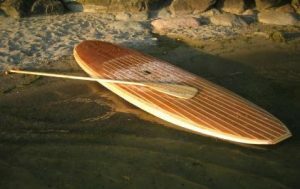 The Stu has a fair amount of nose and tail rocker which make it far more suited to ocean paddling and surfing than to flat water speed paddling.